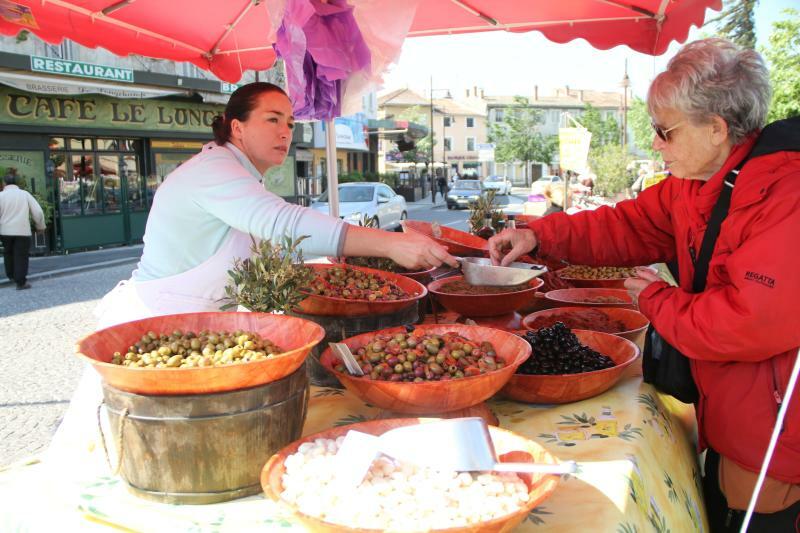 L’Isle-sur-la-Sorgue's Sunday market is one of the largest and most impressive outdoor flea markets in Provence. Walking along the picturesque Sorgue River, you can buy everything from food to antiques, vintage clothing, fine art, fresh cut flowers and even some of the best handmade goods the country has to offer. L’Isle-sur-la-Sorgue is known as the "Venice of Provence" to many locals. Moss covered water wheels trickled in the morning sunlight, brightly coloured houses on either side of the river seem to beam with excitement, green trees hang over sidewalks and alleyways and the smell of freshly baked bread permeats the air. The Market is held every Thursday and Sunday, but the Sunday market is the far superior one to visit. The market begins around 9 am, but the key to enjoying yourself to the fullest is to get here as early as possible. Parking is a premium so I would advise arriving around 8 am, grabbing a coffee and croissant from a local cafe and watching the vendors set up from a comfy bench along the river. Watching the vendors magically unfurl their goods into a full-on shop front is one of the best parts of the market. If you arrive late in the day, there are often no spots available in the parking lot, and you might have to park a long walk away. Be sure not to leave any valuables in your car, since this is a popular tourist spot there is always a chance that someone could break in and best to make sure not to give them any reason to do so. If you are are planning on taking the train, the station is a short walk from the market. This way you won't have to arrive as early as you don't need to fret about finding a good parking spot. While you're waiting for the market to begin to be sure to stop by an ATM. The vendors will almost always only accept cash, and it's good to get enough to last you throughout the day. Since it gets so busy here, it is common for the ATMs to run out of money by midday. Before entering the food and goods market, walk the length of the antique market first. The antiques are located on the south side of the river, nearer to the parking lot. Since the antiques are, literally one-of-a-kind, you don't want to miss out on a special item that might get swooped up by someone else. Haggling isn't a commonality here - the prices are often very well labelled so even if you don't speak French you should be able to shop without having to ask to vendors for pricing. The items in the antique markets are surprisingly well priced. Although things like furniture might not be able to fit into your suitcase, there are lots of smaller items which are worth considering. Many different vendors sell beautiful prints taken from old manuscripts and books and once framed make for a one of a kind souvenir. Textiles are another great thing to keep an eye out for. Napkins, tablecloths, purses and blankets are often beautifully embroidered. They are sometimes even monogrammed - so keep an eye out, and you might even find one that matches with your name! The best approach to tackling this enormous market is to walk the entire length of the river and make notes of everything you're interested in. You'll often find more than one (or a dozen) vendors selling the same items but not always for the same price. If you see something, you LOVE to make a note of where you found it. I use my google maps "drop pin" function to ensure I don't forget where I saw which items. The art galleries on either side of the river are open in the afternoon after the markets have closed down, so you needn't rush into them in the morning. But they are definitely worth your time if you still have some energy. One key thing to making good with the vendors is knowing a bit of French. Although the vendors interact with tourists often, it's nice to show them a bit of respect and even a simple please (s'il vous plaît) or thank you (merci) goes a long way. Now, what are the best items to buy in the market? And what to avoid? The stuff to avoid is quite obvious - anything that isn't decidedly French is usually just "made in China" tat that has nothing to do with being in Provence. I must have seen 100 fidget spinners when we were visiting and couldn't believe how many people bought them - for way more than they should have paid too. So what to buy? One of the best things to do is gather items for a picnic luncheon. Fresh sausage is one of the best items in the market. Packed with incredible spices and made from some of the best meats in France, these cured delights are a must grab! The produce is some of the best in the country in Provence. Melons, peppers, strawberries and cherries as a bright as they are juicy. Often vendors will have samples out in front so you can try whichever one catches your fancy. If you're looking for something to bring home there are an assortment of olive oils in beautifully designed bottles. Olives are another great Provencal treat to enjoy along with the rest of your picnic goods. You can combine all different varieties, perfect for sampling a bit of everything. The French are KNOWN for their cheese and bread! There perhaps isn't a more iconic image of French dining. The cheese on offer here in the market is just as good as any luxury grocery store and often twice as fresh. 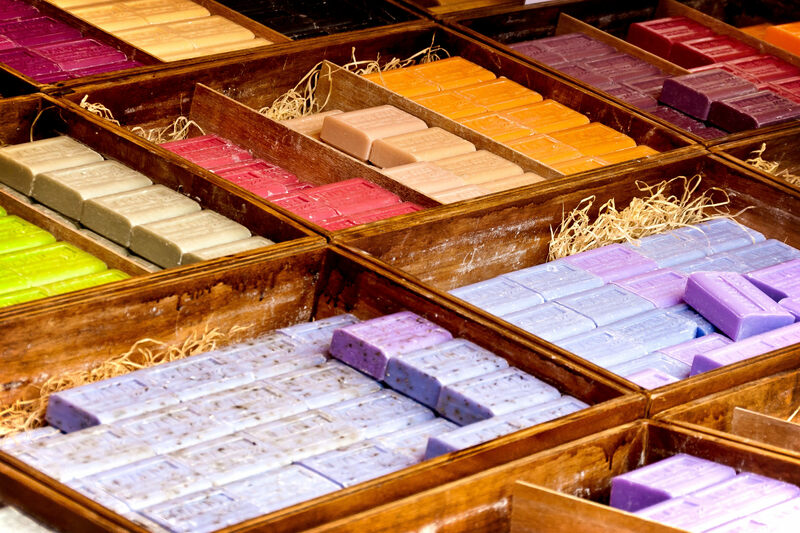 Soap is another thing that you'll see hundreds of, in different designs and prices. Be sure to check to see if it was made in Provence before buying. There will often be a discount if you buy in bulk and these make for great gifts for anyone back at home. If you're staying for a few days, grab a bouquet of flowers to brighten up your hotel room. The smell and colours are unforgettable! Dried lavender is sold in bags and bouquets all over the market and is the perfect thing for displaying at home or in a sachet inside your drawers to keep your clothing smelling fresh. While the market might have the biggest draw don't miss out walking up and down the alleys off of the main drag. These charming little houses are some of the most iconic French buildings you'll see in Provence and shouldn't be missed. There is nothing quite like the brightly coloured facades and vibrant window shutters that line the streets. After grabbing all, you can carry, head back down the river and find a nice spot under the trees. The Avenue des Quatre Otages has a stunning old carousel with large fountain nearby which often features musicians playing to entertain the visitors. This is the ideal spot for your picnic. Along the river's edge are painters set up with the oils and pencils sketching the iconic scenery. Watching them work while enjoying your French meal makes for the a darling little afternoon treat. With your bags and stomachs full, it's time for the day to come to a close and to head back home or to your next adventure! Let me know what your favourite souvenir or find from the market was!